Visually capture and structure ideas and information for clearer thinking and better communication. Personalise with images, colours and styles to create engaging mind maps. Brainstorm thoughts and ideas or take notes with features which allow you to capture and break down information quickly and easily. 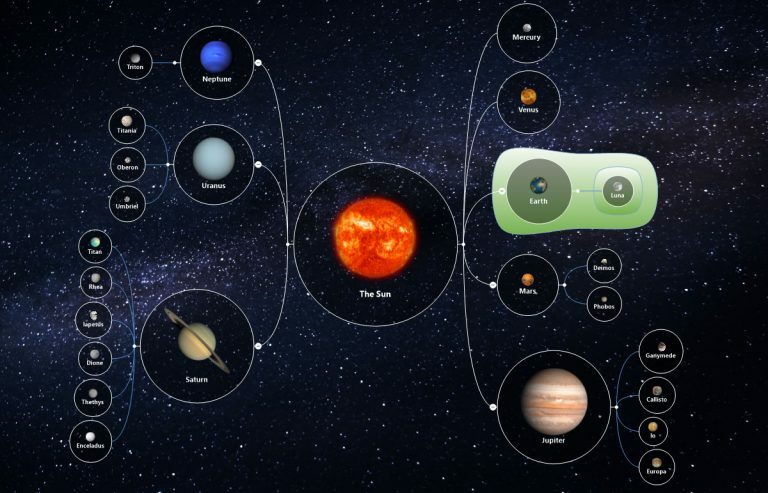 Select from one of our mind map templates or create your own from a blank canvas. Add images from our library or upload your own to improve your understanding and knowledge retention of any topic. Retaining knowledge is easier with visual cues, and adding images and colours to a MindGenius Map is simple. Either use our extensive image library or insert your own. Add images to the background or assign to individual branches. Make your map design unique to you through styling branches, connectors and shapes. Restructure and group information. Assign categories and filters to analyse the information captured. View your map in different layouts appropriate to the topic. Gain a different perspective on your information with dynamic views. What is mind map software? Mind map software is a computerised program used for creating diagrams to display concepts and thought processes visually. Using mind maps allows information to be better organised and due to the visual nature, increases comprehension and information retention. What is mind map software used for? 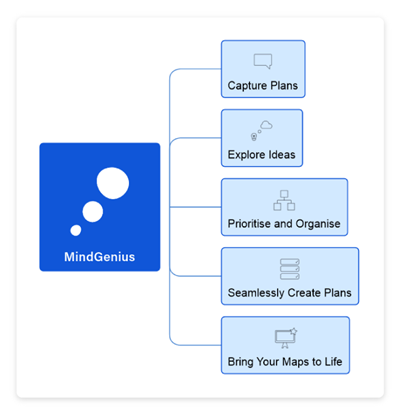 The primary use of mind map software is for brainstorming, although it is also used for more effective note-taking and for organising processes such as project planning. Whilst mind mapping can be done with white boards, flip charts, and even post-it notes, using mind map software lets users better organise information and streamline collaboration enabling groups of users to contribute to idea generation. An additional use for mind map software is to create visual presentations as an alternative to traditional software such as Powerpoint, which is most frequently used by project managers and business analysts because the information is easier to digest and comprehend. What does mind map software do? Mind map software digitises the creation of mind maps. Using software provides much more space and better organisation of data than traditional flip charts offer. Additionally, as the information is digital, it can be easily moved, expanded on, files attached to various branches of a mind map, essentially providing the ability to create a digital file repository into each mind map and share those more easily with remote users. Mind map software is used by business owners, students, project managers, software developers and by charities for brainstorming fundraising ideas, then planning and organising campaigns. Any process requiring collaboration among team members or with third-parties can benefit from using mind map software for idea exploration. One idea leads to another, to another and each can be linked with files added including images until the data is displayed in a uniform fashion that everyone can easily understand. 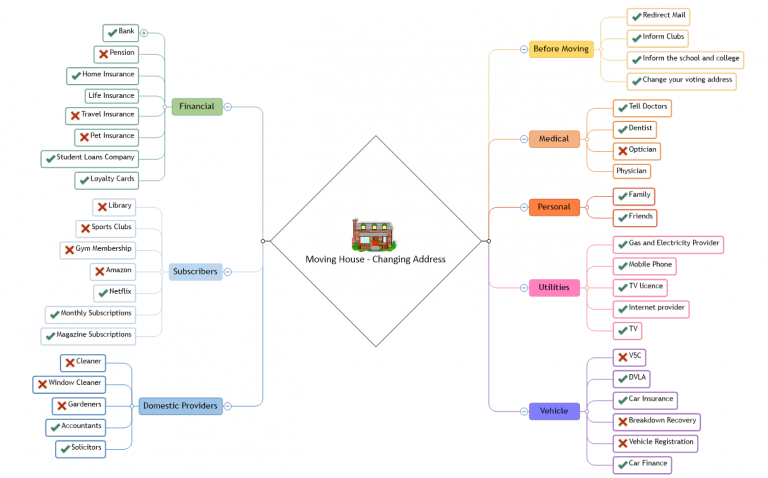 The use of mind map software vs. paper mind mapping is software gives unlimited space to elaborate on information using expanding drop-down branches, connecting those to others and even interlinking multiple mind maps to organise a variety of processes. Anything requiring thorough thought and careful planning can be better illustrated using mind maps to structure data into a logical flow of information. What types of mind map software are there? Mind map software is available as a cloud-based application, via a SaaS (Software-as-a-Service) provider, or as on-premise applications installed to company servers and used on internal business computers. Mind map software provided as a SaaS is often based on single user licencing. The more users there are in teams, the higher the licencing overheads. On-premise mind map software programs can have similar licencing requirements but with enhanced security features enabling businesses to ensure any processes and projects created are contained within the businesses private network, and not uploaded to a third-party server. Cloud-based mind map software may be available across multiple devices while on-premise programs can require businesses to have the right hardware that meets the minimum operating systems requirements.